The Sleep Revolution: Two years later. About two years have passed since the hardcover version of The Sleep Revolution was published. 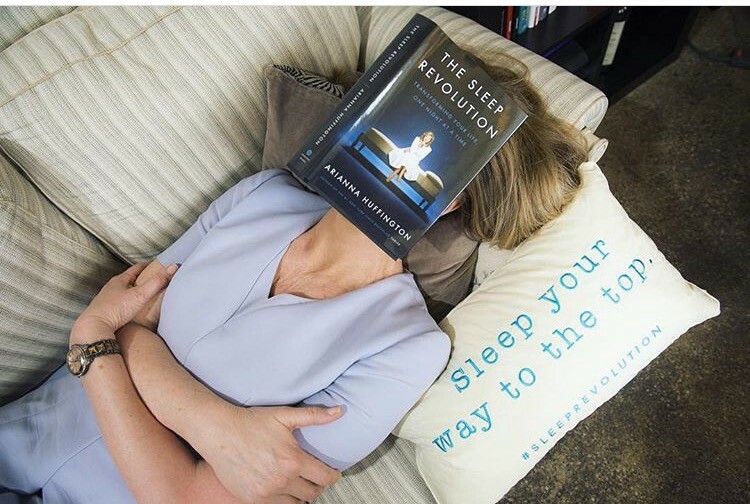 And as I’ve gone around the world talking about how to Thrive in our lives — to college students, to businesses, to tech workers, to people of all ages and from all walks of life — the response has shown that the sleep revolution has progressed way beyond where it was when I started thinking about the book. We’re in the middle of a cultural shift, one in which more and more of us are taking steps to reclaim sleep, and in doing so we’re taking back a part of our lives that is fundamental to every aspect of our health, happiness, and well-being. When I first started my sleep evangelism — after collapsing from sleep deprivation and burnout in 2007 — the conversation around sleep was still largely just about convincing people that sleep was important, or even worth talking about. This past year has left no doubt that we’re now past the convincing stage. The idea that sleep is a subject worthy of our attention is clearly resonating. Everywhere I’ve gone over the past year, I’ve been besieged by people coming up to me and asking for sleep tips (and offering their own), telling me about the changes they’re making in their lives to improve their sleep, or just commiserating about how hard it is to get enough. Every time I do a television show or record a podcast, the hosts will approach me before the show or during the break to talk about their own sleep problems — or successes — though usually the former. To help accelerate the culture shift and end the delusion that we need to burn out to succeed, I founded a new company, Thrive Global, a corporate and consumer well-being platform dedicated to changing the way we work and live. And after eleven years, I even left The Huffington Post — which I love — to dedicate myself full-time to helping us change the way we work and live — to help us move from merely surviving to thriving. Since my decision, I’ve been asked a lot why I left The Huffington Post, a very successful business, to found a start-up. Wasn’t it hard, people have wondered, leaving an established business with my name on the front door to start all over again? It’s always hard to leave something you built and love, but given how big this epidemic of stress and burnout is around the world, and how hungry people are for change, I realized I could no longer just write about this problem — I had to do something about it. It was a call to action I couldn’t ignore. And sleep, of course, is at the heart of this culture shift. And more and more people realize this. You can see it in virtually every part of our culture — from schools and businesses to pop culture and even the government. One of the things I was most impressed with was how much more passion and awareness young people bring to the issue of sleep than my generation did. In April of 2016, I launched the Sleep Revolution College Tour. The plan was for 50 colleges and universities to host fairs featuring sleep-related events, social media campaigns, and giveaways of sleep products. A month in, more than 300 schools had joined the effort, and by the time we finished we were at over 400. That’s hugely significant, because studies show that millennials are the most stressed demographic — often because students feel as if they have to pick among sleep, academic success, and their social lives, when in fact sleep is actually the ultimate academic performance enhancer, and it’s hard to have much fun when you are running on empty. And it’s not just college students who are affected by sleep deprivation. In this book I write about the harmful effects on many middle and high school students of early start times for school — including depression, anxiety, and poor academic performance. And I’m happy to say that change has been afoot on this issue, too. In May 2016, New Jersey education officials held hearings on whether certain schools should move to later start times, in order to bring the state more in line with recommendations by the American Academy of Pediatrics that classes begin no earlier than 8:30 a.m. Right now, only 18 percent of schools nationwide meet that standard. But New Jersey officials say that certain state schools could start experimenting with later times as early as 2018, and Maryland recently passed a bill offering incentives for high schools to do the same thing. One of the more amazing signs of the acceleration of the cultural shift that is taking place is an article that appeared in The Harvard Business Review in February 2016 about how “sleep deficiencies can undermine important forms of leadership behavior.” The authors were both from McKinsey, the management consulting firm — and one of them is, yes, a sleep specialist. Now, if someone, even a year ago, had shown me an article written by McKinsey consultants saying that the way for executives to be better leaders is to sleep more, not less, and that McKinsey would actually have a sleep specialist on staff, I would have assumed the piece was from The Onion. More and more top business leaders are doing just that. One of the most important parts of this cultural shift is changing our workplace culture — perhaps the biggest single factor in taking back our sleep. If we don’t continue to chip away at our collective delusion that burnout is the price we must pay for success, we’ll never be able to restore sleep to its rightful place in our lives. The good news is that more and more business leaders are realizing that what’s good for their employees’ well-being is also good for business. Mark Bertolini, CEO of Aetna, the health-care benefits company, has long been a leading voice in changing our workplace culture. First, he offered yoga and meditation to Aetna employees, with a resulting drop in health-care costs and an increase in productivity. Then, he began an innovative sleep program, encouraging Aetna employees to sleep more by paying them more. Those who get seven hours of sleep can earn $25 extra per night, up to $300 per year. It’s a great way to make the point that when employees get the sleep they need, it’s not just good for them, it’s also good for the company’s bottom line. Awareness of the dangers of sleep deprivation extends to air travel, as well. In April 2016, Captain Chesley “Sully” Sullenberger, who famously guided all 155 passengers of U.S. Airways Flight 1549 to a safe landing in the Hudson River, traveled to Washington to lobby for passage of the Safe Skies Act, which would give cargo pilots the same rest requirements as pilots of passenger planes. “Let me be very direct,” he said. “Fatigue is a killer.” And in New York City, Governor Andrew Cuomo announced in April 2016 that the Metropolitan Transit Authority would begin testing employees for sleep apnea. This came in reaction to a deadly 2013 Metro-North derailment, in which the train’s engineer had been living with an undiagnosed case of the sleep disorder. So it’s been an incredible year for making us more aware of the importance of sleep in our lives. We’ve got a long way to go, but it’s clear that we’re waking up to the power of sleep. It’s both unique and universal, intensely personal and yet common to us all. It gives us strength, energy, power, and creativity. It makes us happier, less anxious, more productive, and more able to handle the everyday stress of our lives. But sleep should also be savored for its mystery, the way it provides a pathway for us to travel across time, to go inward and access a deeper part of ourselves. I’m thrilled to say that the Sleep Revolution is in full swing, and I hope that after reading this book, you’ll join us. Excerpted from The Sleep Revolution by Arianna Huffington. Published by Harmony Books, an imprint of Penguin Random House LLC. All rights reserved.